CBE helps its clients to create or improve their purchase organization. CBE offers an organizational approach that delivers a proper alignment between the purchasing activities and the business needs of a company. The integration of the business functions dealing with purchasing, making them sharing common efforts and intents, is one of the focuses of CBE’s consultancy in this field. Contribute to the development of the economical results of the company, obtaining from the market: price reductions, profitable purchase conditions and the possibility to sensibly reduce stocks and the invested capital. 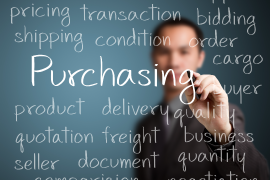 How to analyze, divide and rationalize the purchase expenses? What to do in order to find, systematically evaluate and reduce the business risks connected to suppliers and to the purchase markets? How to plan and realize a Supplier Management Process that fosters research, qualification and development of the main suppliers of the business? How to organize and implement purchase strategies of early involvement in those fields where tenders or other activities that require important purchases are needed? In particular when talking about process innovation and procurement engineering? How to provide systematic surveys and systems of control of the purchasing results, through the development of adequate systems of KPI (Key Performance Indicators) and BSC (Balance Score Cards)?